This Scart RGB video/audio to HDMI converter unit is designed for up-converting the analog SCART type RGB or composite A/V type signal to HDMI type up to 1080p, providing the highest levels of video and audio quality through single HDMI cable. This analog to digital converter supports total of two A/V inputs, one Euro-SCART type input and one HDMI input, which is backwards compatible with DVI-D type. An input button on the front of this converter allows users to switch between input sources. The Scart type A/V devices are commonly found in Europe such as from Sky box, standard DVD player, freeview satellite STB, video game console and so on. converting analog RGB/composite video to digital HDMI or DVI formats for newer HDTV displays or digital monitors. outputting the transcoded video to selectable HD resolution through advanced up-scaling function built in. decoding the audio feed embedded from its input signal into both analog and digital audio simultaneously for connection with external amplifier/receiver, stereo system or headphone for better sonic performance. The audio channel from its Scart input or HDMI input will also be converted into analog stereo 3.5mm headphone type and digital S/PDIF in coax type with optimum audio quality. This RGB to HDMI converter is very suitable for all professional and home entertainment uses. Easily upgrading your home entertainment systems to high resolution output with this innovative device. Users can easily switch between its Scart input and HDMI input for conversion by pushing its input source selection switch. The conversion is all done automatically. Manual push buttons available on the front panel for input selection and output resolution selection. This innovative converter can upscale any SCART(RGB or CVSB) video device to HDMI type for large-screen flat panel displays. It supports both 15Khz type RGBS or composite A/V inputs in SCART formation and converts to HDMI format at selectable 50Hz or 60Hz vertical rate. This RGB/CVSB to HDMI converter allows users able to play the old school games in HDMI on a large flat screen TV and get sharper image quality with vibrant colors from those classical game consoles for true visual sensation and entertainment. This unit can also be used for scaling the HDMI input to HDMI or DVI format in HD resolution at 720P/1080P or digital RGB resolution at 800x600, 1024x768, 1280x1024, 1280x720, 1920x1080 pixels. This converter also helps users connect DVI video devices or computer DVI video graphic cards to HDTV displays. This converter is also an audio extractor. It can extract the audio embedded in HDMI feed or Scart device input and then further decoded into digital audio and analog stereo outputs. 1 HDMI audio pass-through if the HDMI input source has audio embedded. Both digital audio and analog stereo will always be synchronized with its HDMI output. This unit has a manual switch button for selecting either 50Hz or 60Hz vertical for its HDMI output on a PAL or NTSC TV display. 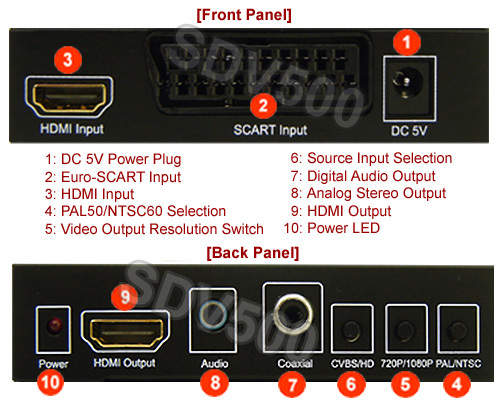 Up-converting Scart type CV/SV video (PAL/NTSC) and RGB (480i, 576i) to HDMI or optional DVI type. Supports HDMI to HDMI/DVI scaling and format conversion. Audio extractor for Scart RGB/CVSB and HDMI feeds. Compliant with HDMI 1.3 HDCP 1.2 and DVI 1.0. Extracts SCART audio to analog 3.5mm stereo and digital S/PDIF in coax type for amplifier, audio receiver or headphone. 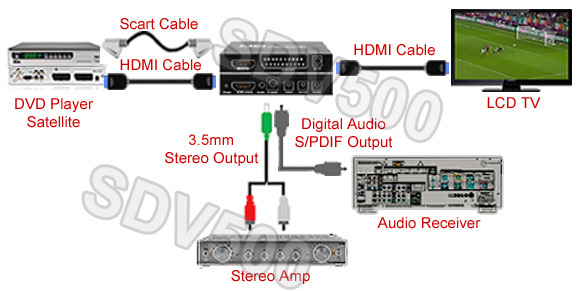 Extracts HDMI audio to analog 3.5mm stereo and digital S/PDIF in coax type for amplifier, audio receiver or headphone. Automatic lip-sync ensures audio video synchronization. RGB input at 50Hz or 60Hz vertical rate and composite NTSC/PAL video will be automatically detected and adjusted. Backwards compatible with all DVI HD devices and DVI HD displays via using HDMI to DVI adapter cable. 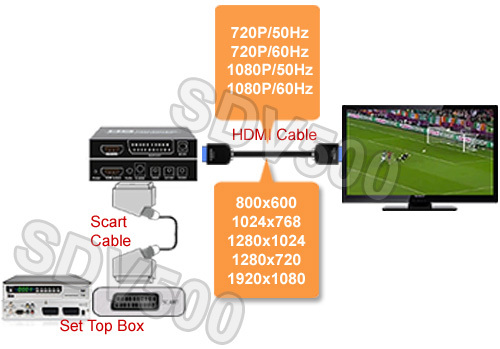 Works with SCART DVD players, Sky STBs, satellite receivers, etc. Works with many classic RGB video game consoles such as NES, SNES, Sega Saturn, Genesis, Dreamcast, Atari, etc. Supports 50Hz/60Hz vertical rate output selection. Manual push buttons available on the front panel for input selection and output resolution selection. Compact design with sturdy metal enclosure.